Comments Off on Paul’s Plant Pick: A Feeding Frenzy! Having spent the last 15 days setting up and being at Canada Blooms, I have had little opportunity for my routine walks through the TBG gardens. So on Monday morning I was amazed to see the changes that had taken place. Buds are swelling on the trees and shrubs and perennial and bulb shoots are pushing up through the soil. This is such an exciting time of year. I often walk around the garden to pick up any waste or recyclables that, for whatever reason, seem not to have made it into the appropriate disposal bin. While picking up some newsprint that had blown into the pollinator garden adjoining the Weston Family Library, I was surprised by the buzz that filled the air. 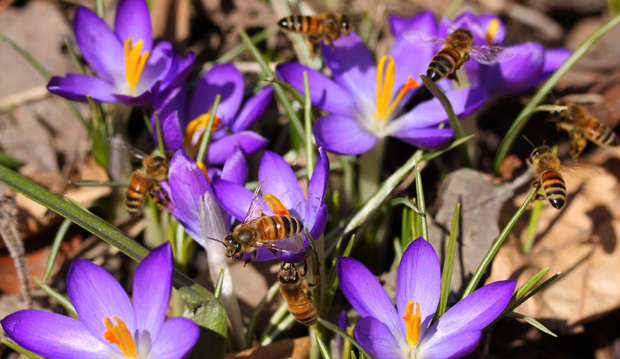 There they were, our resident honeybees busily feeding on the Crocus that were in full bloom in the sunniest part of this garden. It was a total frenzy! Upon closer inspection I could see multiple bees landing in the same flower. Thank goodness I had my camera with me. What a treat to see, hear and experience. As far as I’m concerned, you can never have enough flowers in the garden, especially those that help feed the bees and other pollinators. If you look closely at the above image, you can observe one bee working her way into a crocus blossom that had not even opened! Very interesting. Nearby, the Helleborus ‘Pink Frost’ are also about to bloom and hence provide more sustenance for these hard-working creatures. It won’t be long before the Scilla and the Cornus mas also come into bloom. The gardens at the Toronto Botanical Garden are always changing and soon we will experience a wonderful explosion of spring growth and bloom. Visit often and catch the magic!